Oman's gas production levels are set to surpass oil by 2023 thanks to an impressive surge in the development of gas fields in the sultanate, according to Rystad Energy, the independent energy research and consulting firm headquartered in Norway. "Gas is on the rise in the Arab country on the southeastern coast of the Arabian Peninsula in Western Asia, and this transition is very timely. Oil output declines over the last two years may indicate a point of no return for Omani oil, but the country's sliding oil production is set to be replaced by gas," said Rystad Energy analyst Aditya Saraswat. At peak production in 2016, Oman's oil output reached 900,000 barrels per day (bpd), declining to 870,000 bpd by 2018. 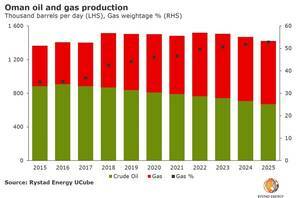 Rystad Energy estimates that by 2025 oil production will decrease by an additional 200,000 bpd, as output from older fields continues to slump. As new oilfield developments have failed to stabilize the country's crude output, Oman has shifted its focus to invest in gas developments. This will see gas production escalate to approximately 130 million cubic meters per day (MMcmd) by 2025, shifting Oman's oil-gas production mix from about 35% gas in 2015 to over 50% in 2025. "This is a tremendous turnaround from the near-stagnant 80 MMcmd of gas output from 2008 through 2016," Saraswat remarked. He added: "Amidst rising global liquefied natural gas (LNG) demand and the increasingly lucrative domestic gas market, international players are favoring gas developments in Oman. The strengthened gas market will help gas production levels to outshine Oman's dwindling oil production, with gas output projected to overtake oil by 2023."